229 Beacon is located on the south side of Beacon, between Clarendon and Dartmouth, with 227 Beacon to the east and 231 Beacon to the west. 229 Beacon was built in 1868-1869 for building contractor George Wheatland, Jr., for speculative sale, one of four contiguous houses (223-225-227-229 Beacon) designed as a symmetrical group. 223 Beacon and 229 Beacon are on 19.5 foot lots and have double oriel windows (to which a third, smaller extension has been added at 229 Beacon), and 225 Beacon and 227 Beacon are on 18 foot lots and have single oriel windows. George Wheatland, Jr., assembled the 75 foot lot for the four houses in two transactions. He purchased the western two feet on March 18, 1868, from attorney Edwin H. Abbot, it being the western portion of a 20 foot lot Edwin Abbot had purchased from the Commonwealth of Massachusetts on January 3, 1867. He purchased the eastern 73 feet on April 10, 1868, from attorney Peleg Whitman Chandler, comprising three lots Peleg Chandler had purchased from the Commonwealth: a 25 foot lot to the east he purchased on September 19, 1865, and two 24 foot lots he purchased on January 4, 1866. Click here for an index to the deeds for 229 Beacon. On April 1, 1869, 229 Beacon was purchased from George Wheatland, Jr., by Dr. John Nelson Borland, a physician, and his wife, Madeline (Gibson) Borland. They previously had lived at 69 Mt. Vernon. 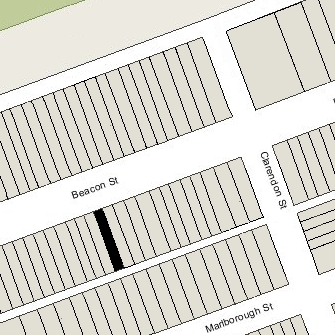 His brother and sister-in-law, Melancthon Woolsey Borland and Julia (Gibson) Borland, lived next door at 227 Beacon. Madeline and Julia Borland were sisters. John and Madeline Borland continued to live at 229 Beacon in 1879, but by 1880 had retired to a farm in Waterford, Connecticut. He continued to own 229 Beacon and lease it to others. When they were in Boston, the Borlands probably lived with his unmarried sister, Alida Borland, at 255 Commonwealth; he was living there at the time of his death in August of 1890. By the 1879-1880 winter season, 229 Beacon was the home of Stanley Cunningham, a cotton broker, and his wife Mary Ann (Crehore) Cunningham. They had married in October of 1879 and 229 Beacon probably was their first home together. His mother, Sarah Maria (Parker) Cunningham, widow of shipping merchant Frederic Cunningham, lived with them. Stanley Cunningham and his mother previously had lived at 4 Chestnut. They continued to live at 229 Beacon during the 1881-1882 winter season. Thereafter, Stanley and Mary Ann Cunningham moved to 167 Newbury, and Sarah Cunningham moved to 273 Clarendon. By the 1882-1883 winter season, 229 Beacon was the home of attorney Charles Franklin Shimmin and his wife, Mary Harriet (Parkman) Shimmin. They previously had lived at 93 Mt. Vernon. The Shimmins leased 229 Beacon from John Borland until his death in 1890; on December 31, 1890, they purchased it from his estate. During the 1889-1890 winter season, the Shimmins were living elsewhere and 229 Beacon was the home of Miss Mary Quincy, She previously had lived at 425 Beacon. 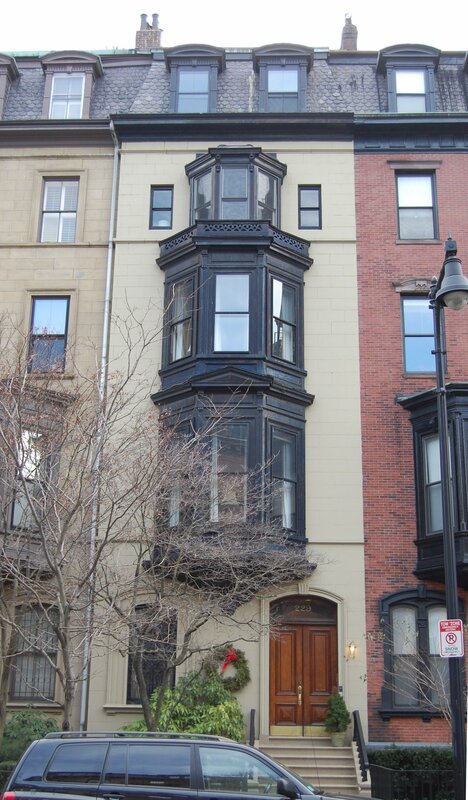 By the 1890-1891 season, she had moved to 29 Massachusetts Avenue, and 229 Beacon was once again the Shimmins’ home. Charles Shimmin died in July of 1891. After his death, Mary Shimmin and their unmarried daughter, Blanche, continued to live at 229 Beacon. Mary Shimmin died in June of 1903. The house was not listed in the 1904 Blue Book, and by the 1904-1905 winter season, Blanche Shimmin was living at the Empire Hotel at 333 Commonwealth. She inherited 229 Beacon from her parents and leased it to others. During the 1904-1905 winter season, it was the home of Frederic Blake Holder and his wife, Agnes Lloyd (Woodruff) Holder. He was a retired metals dealer and importer. They also maintained a home in Weston. By mid-1905, the Holders had moved to 246 Beacon and 229 Beacon was briefly the home of real estate trustee, investor, and broker Richard Sears. By the 1905-1906 winter season, 229 Beacon had become the home of Brooks Adams and his wife, Evelyn (Davis) Adams. They also maintained a home in Quincy. Brooks Adams was a lawyer, author, and historian. During the period he and his wife lived at 229 Beacon, he was a lecturer at the Boston University School of Law. They continued to live there in 1909, but had moved to 33 Chestnut by 1910. In 1910 and 1911, 229 Beacon was the home of Brooks Adams’s nephew and his wife, Charles Francis Adams 2nd and Frances (Lovering) Adams. They previously had lived in Concord, where they continued to maintain a home. Charles Francis Adams 2nd (called “2nd” to distinguish him from his uncle, Charles Francis Adams, Jr.) was a lawyer and treasurer of Harvard. He later would become Secretary of the Navy in the Hoover Administration and then Chairman of the Board of the State Street Trust Company. They continued to live at 229 Beacon in 1911, but by the 1911-1912 winter season had moved to 177 Commonwealth, which had been the home of his mother, Fanny Cadwallader (Crowninshield) Adams, the widow of John Quincy Adams. She had died in May of 1911. During the 1911-1912 winter season, 229 Beacon was the home of William Henry Bowker, president of the Bowker Fertilizer Company, and his wife, Charlotte Jeanette (Ryder) Bowker. They had lived at 265 Clarendon during the previous season. By the 1912-1913 season, they had moved to 231 Beacon. Blanche Shimmin died in December of 1912. 229 Beacon was not listed in the 1913-1915 Blue Books. By 1915-1916 winter season, it was once again the home Richard Sears, who had lived there briefly in 1905. He had married in November of 1913 to Susan Elizabeth Goetel Drake. After their marriage, they had lived at 265 Clarendon. They also maintained a home in Ipswich. Richard and Susan Sears leased 229 Beacon from the estate of Blanche Shimmin until 1920. On June 21, 1920, Richard Sears acquired the property, and on October 18, 1920, he transferred it to his wife. Richard Sears died in September of 1943. Susan Sears continued to live at 229 Beacon until her death in March of 1973. On June 1, 1973, 229 Beacon was purchased from Susan Sears’s estate by Norris Strawbridge and M. Gwinn V. Strawbridge, doing business as 229 Beacon Street Company. In August of 1973, they applied for (and subsequently received) permission to convert the house from a single-family dwelling into four apartments. On July 9, 1974, Norris Strawbridge and M. Gwinn V. Strawbridge transferred the property to a limited partnership, and on December 3, 1979, they transferred it into Norris Strawbridge’s name. On January 2, 1980, Norris Strawbridge converted the property into four condominium units, the 229 Beacon Street Condominium.